The reactions and questions were identical. 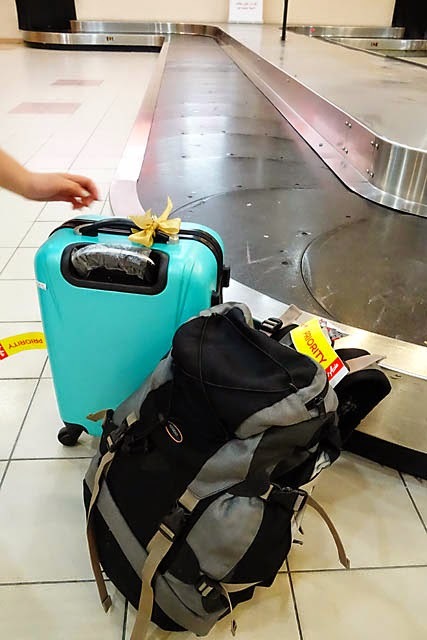 I had told my family and friends that I would be visiting Kota Kinabalu (commonly shortened to just KK) for a couple of days. And that hiking up Mt Kinabalu was not part of the itinerary. So what would I be doing there if not for climbing up the highest mountain on the island of Borneo? The funny thing is, I did not know either. Well, I would be finding out myself. 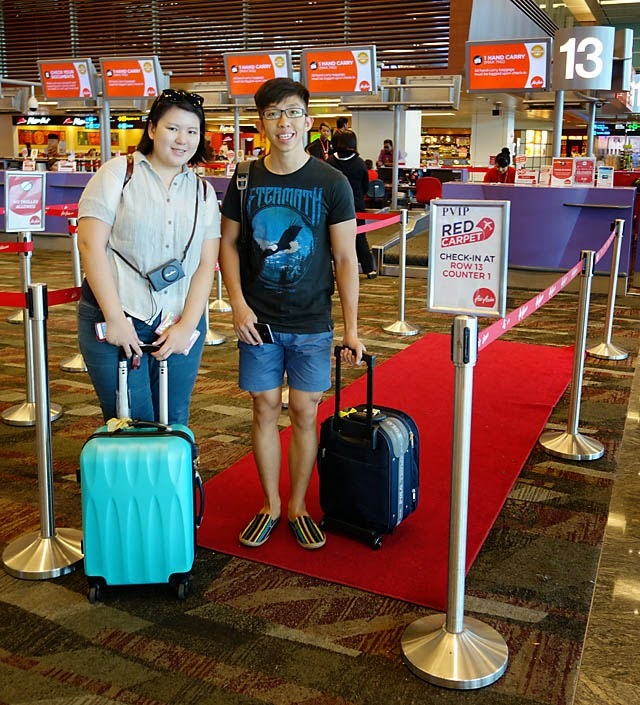 Together with 2 other bloggers, we were invited to experience the hospitality of KK. 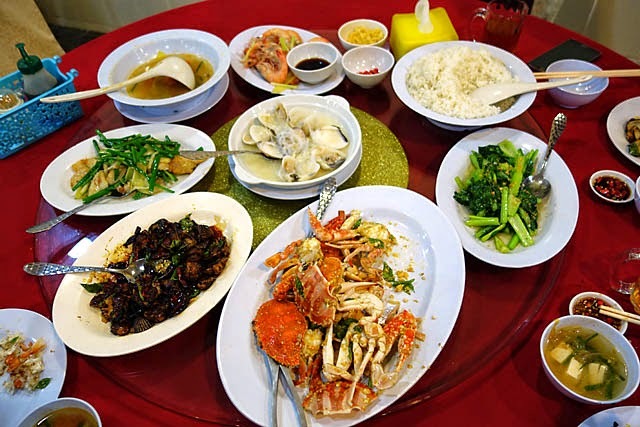 As we chatted over our late dinner in Cafe Boleh in the Pacific Sutera hotel, it seemed a common misconception that aside from climbing Mt Kinabalu, what else is there? 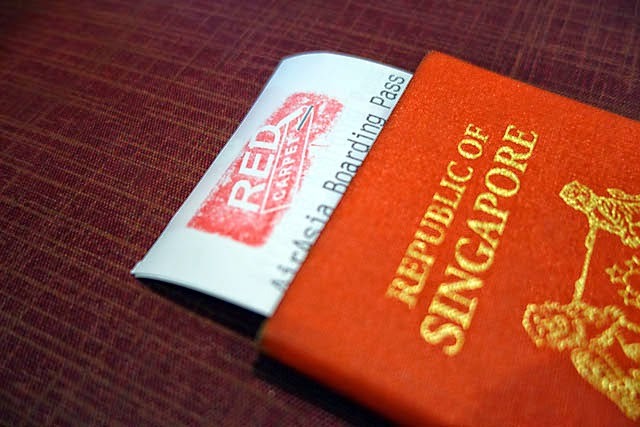 Boarding pass marked "Red Carpet"
Priority baggage handling! Yes, all the others are not even out yet! 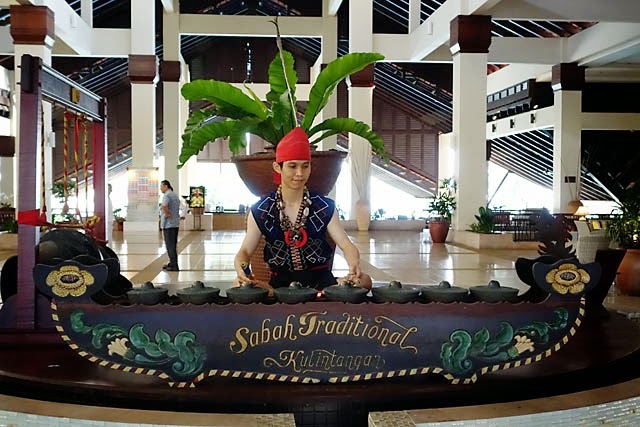 We were hosted by Sutera Harbour Resort, which have 2 hotels in its premises - The Pacific Sutera Hotel and The Magellan Sutera Resort. 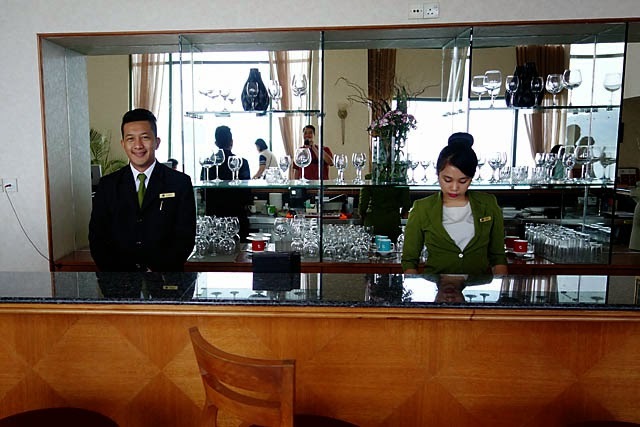 The Pacific Sutera, equipped with business suites with wonderful views, as well as access to the Pacific Club Lounge, is popular for business travelers. 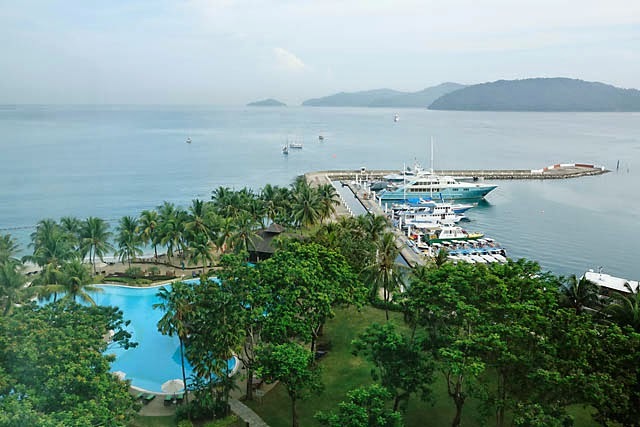 The Sutera Harbour Marina Golf and Country Club sits between the two with facilities like a 104-berth marina and 27-hole a golf course. 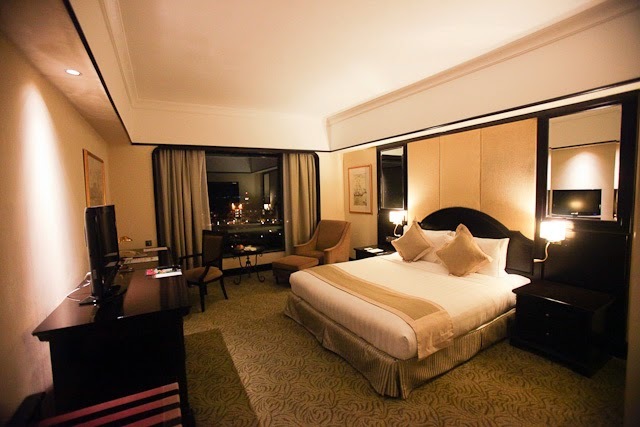 Our stay for the night was at the Pacific Sutera. 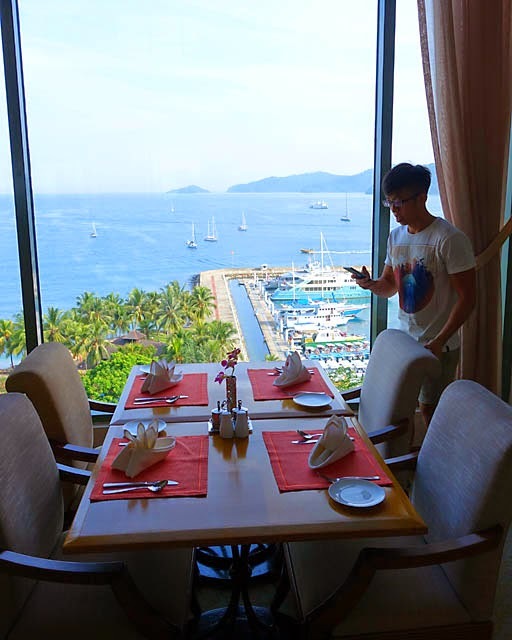 We were introduced to the Pacific Club lounge the next morning for breakfast with Tracy Lim, the Communications Manager for Sutera Harbour Resort, and our host for the trip. Situated at the top of the hotel, the day can't start any better with such views for breakfast! 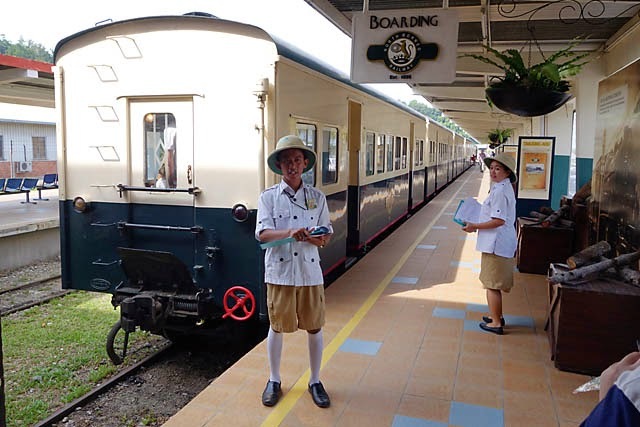 Our first activity of the day was a ride on an authentic steam-engined train - the North Borneo Railway. 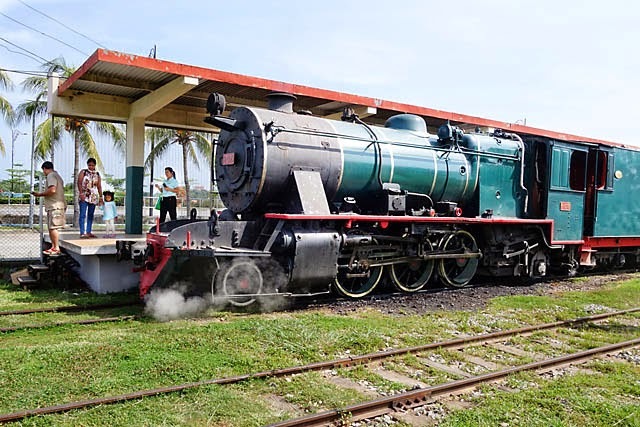 Brought back to life from a museum, the train now runs twice weekly for tourists, from Tanjung Aru to Papar. 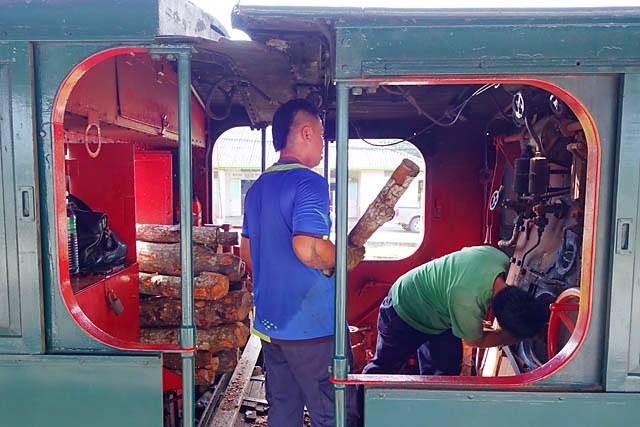 The firing of the train engine was quite a draw, as everyone clamored to see the engineers throwing log wood to feed the fire that build the steam that drives the train. It was definitely a throwback to the old days. This was not the only throwback, as the seating and service attire within the train was reminiscent of the olden days. Firewood is still used to run the train! 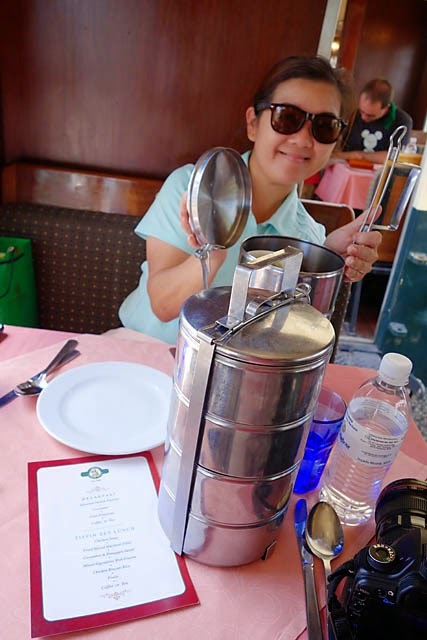 Our guide Grace Leong, with over 20 years of experience under her belt, was on hand to fill in all the details of the journey. Passing through traditional villages and small towns, paddi fields and mangrove forests, the ride was really pleasant, except for the tropical heat. 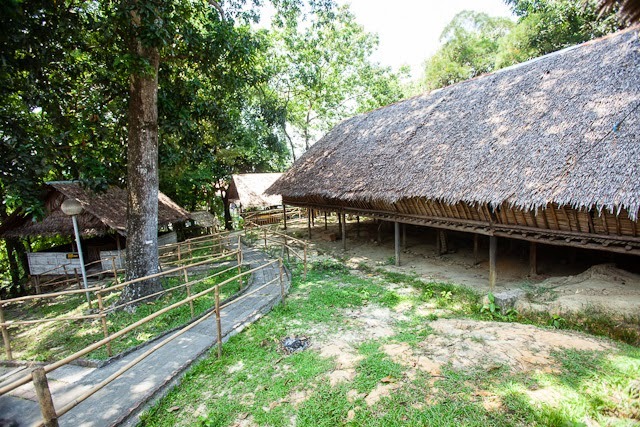 Through it all, Grace enthusiastically plied us with information and history on the surrounds and also Sabah in general. 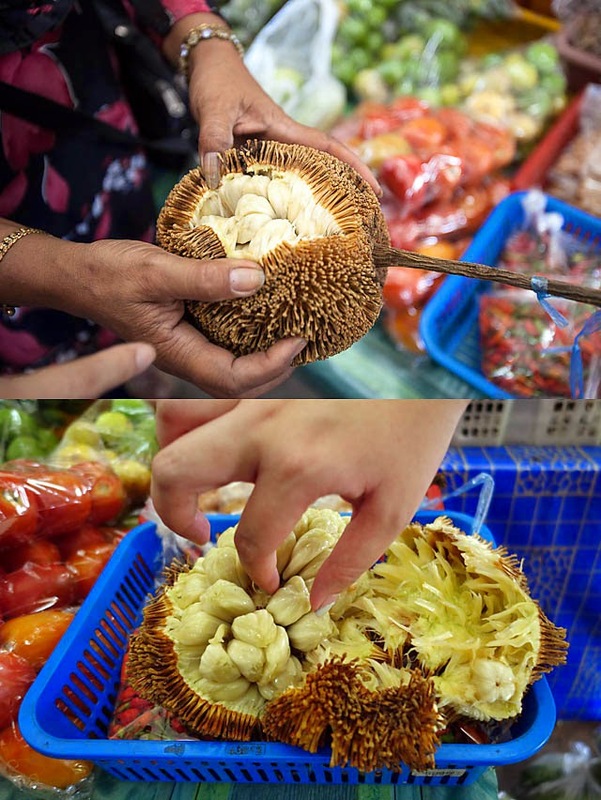 There were stops along the way where we could disembark for a short walk around, and the highlight for me was a visit to a local market where Grace introduced us to a local fruit - Tarap. Found nowhere else, it looks like a jackfruit but taste like soursop! The service onboard was really thoughtful as after each outing, we were presented with this cold-pressed towel which was a god-send in the sweltering heat. 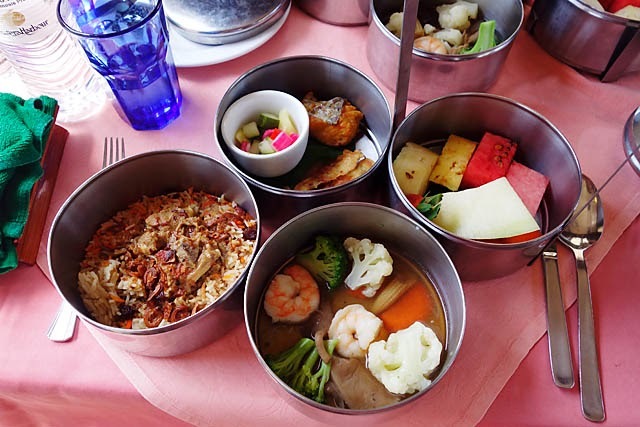 To complete an overall wonderful experience, and a further throwback to old times, lunch was then provided in tiffen boxes! Cute! What better way to close the day than a sunset cruise? That's exactly what we did in the evening. 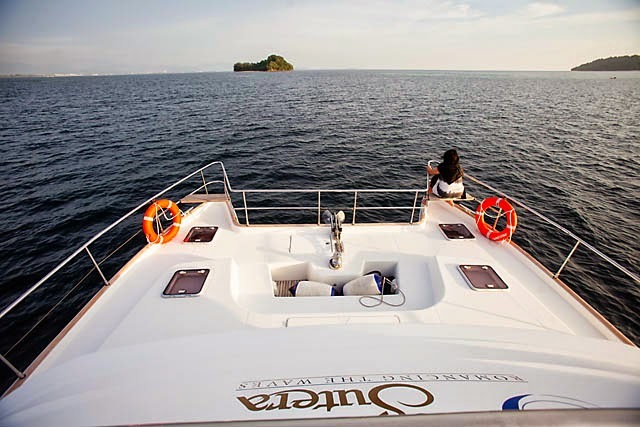 At the Sutera Harbour Marina, we boarded the Puteri Sutera and went cruising round the islands of Tunku Abdul Rahman Marine Park. 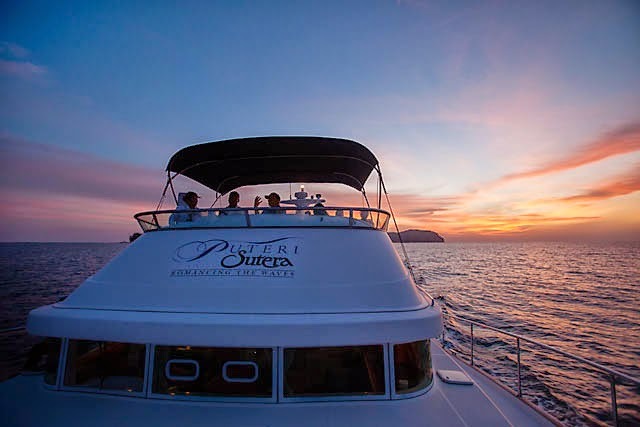 I would think for group outings, these sunset cruises make excellent options. There are very little things that could beat chilling out on a deck of a beautiful boat with good company and feeling the wind massaging your face and blowing all your worries and stress away. Just before the sunset hour, some tapas and refreshment were brought out to complement the experience. We did not know it then, but this happened to be the best sunset of the few days we were there! Day 3 brought out new excitement for us as the day was scheduled to be out on a reef pontoon. 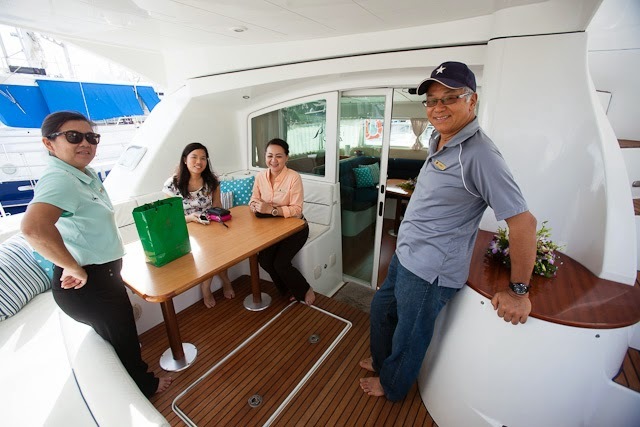 Our host for the day, Mr Youngcrippen from Borneo Passages, was all smiles. We'll call him Young for short. After all, today's activities are certainly targeted for the young! Oliver up in the air! Next up was something that sounded no less thrilling. The world's longest island-to-island zipline! 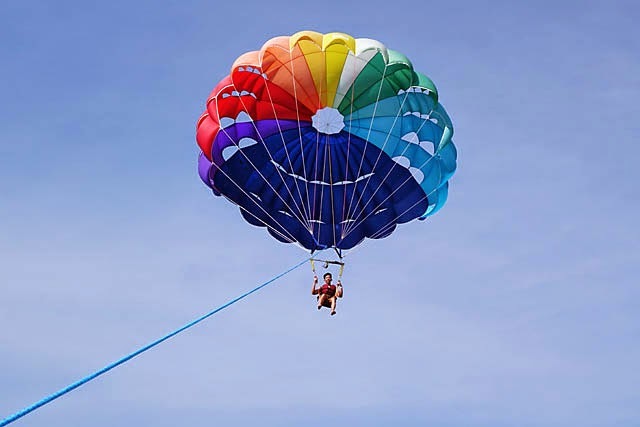 We were brought to Sapi island where Coral Flyer, the operator of the zipline, is situated. It was a spanking new attraction, barely a few weeks old. After the formalities are done (which included the signing of an indemnity form), we were brought to the neighboring island where we would be ziplining back to Sapi. In all the excitement, I was still carrying my bulging camera slingbag! 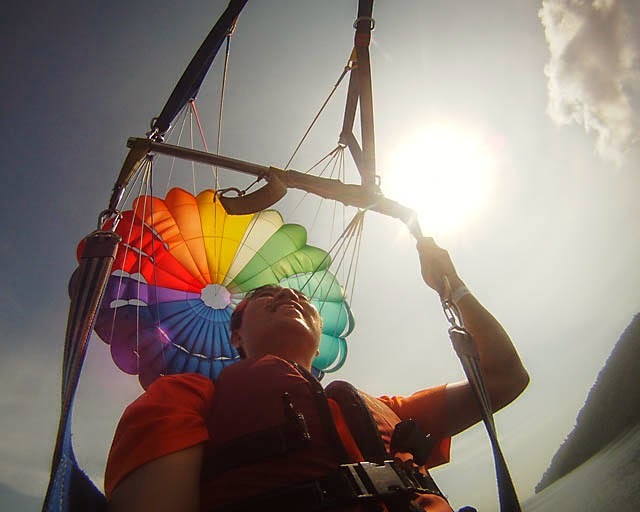 Would I be zipping through the air with my slingbag dangling by my side? 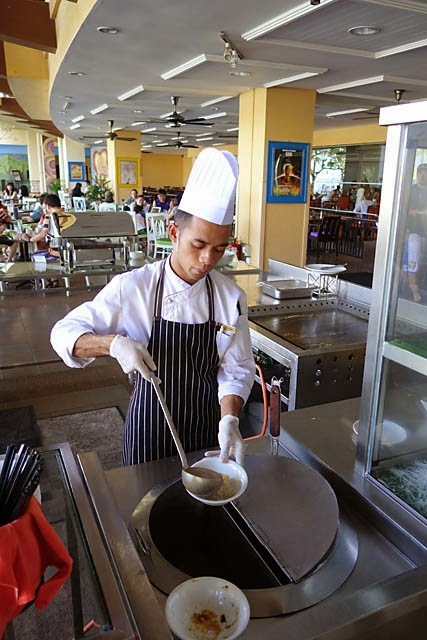 The staff nonchalantly affirmed that it would be so... I wouldn't need to be worried though. The gradient of the slope was actually quite gradual, and as such, the speed was alot less than I imagined it to be. Which kind of made the activity less "exciting" to me. 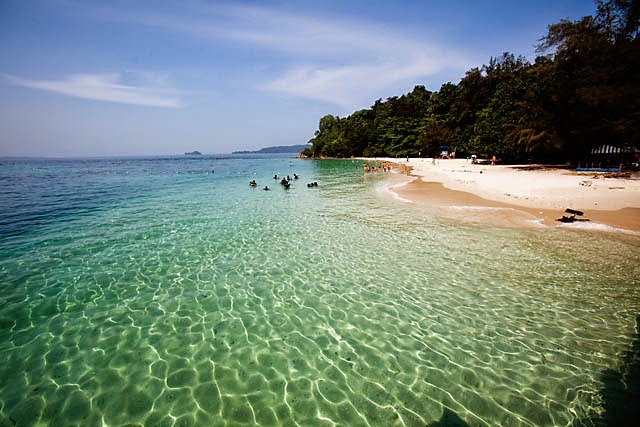 However, the views more than made up for it - the waters around Sapi island are out of this world! 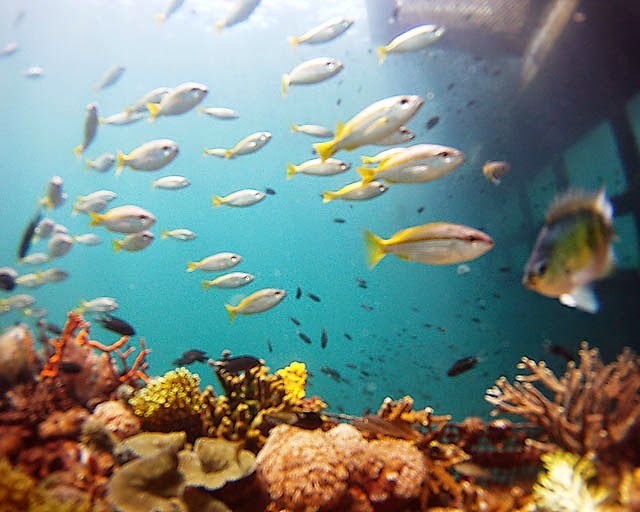 Back at the pontoon, Jonathan Wheeler, manager at the Borneo Reef World, gave us a tour of the pontoon, which included an underwater observatory! We had a quick lunch, cooked fresh on the pontoon, before eagerly "plunging" into our next activity. Another first for me, we got to experience a "sea/scuba walk". Essentially, we could literally walk underwater with just a specially fitted "helmet" placed over our head. 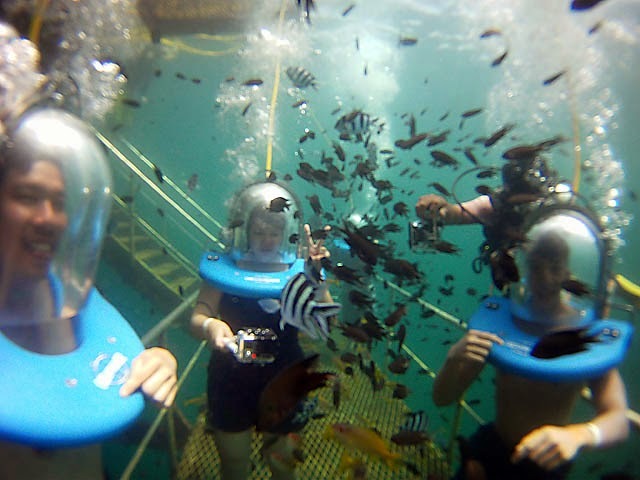 We could breath normally under this helmet, and so we just concentrated at gaping at the beautiful corals and schools of fish swarming about us. And as if that was not enough, it was followed by a "Discovery Dive". We were given a 10-minute crash course on diving, complete with scuba gear - flippers and oxygen tanks and all. The instructors then led us on a short dive to marvel at the wonders of the sea floor. 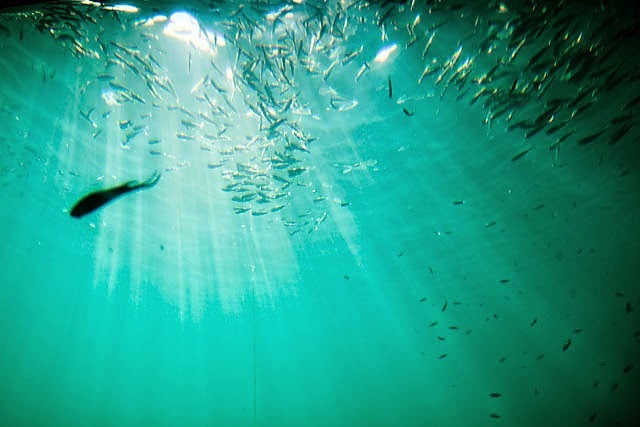 The underwater world is a whole new world, and it was easy for me to be completely lost in it. 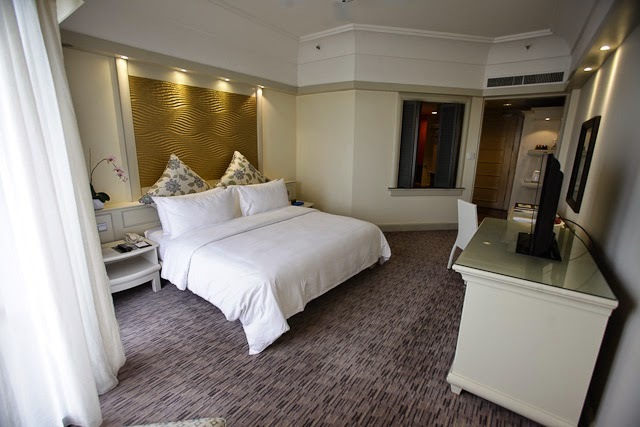 Back at Sutera Harbour Resorts, we have moved to the Magellan Sutera for our stay. 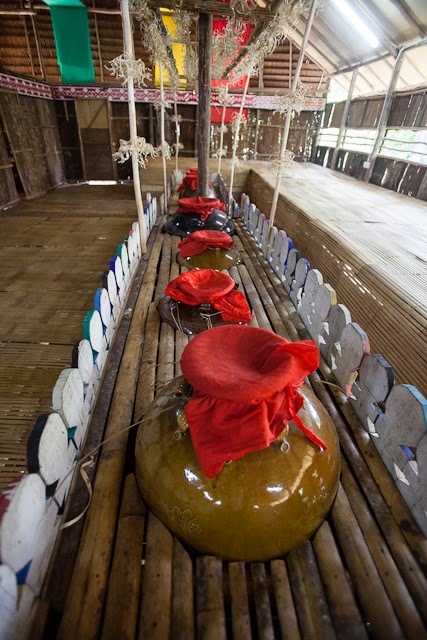 The hotel lobby was magnificently huge and modeled after a Sabah longhouse. 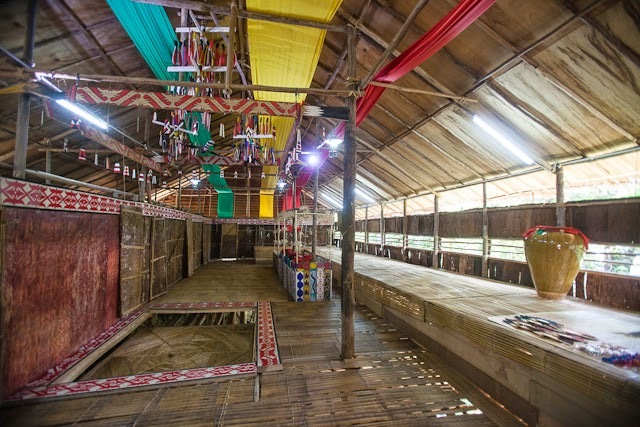 They even engaged someone dressed in the ethnic tribal attire to play some traditional music during certain hours. 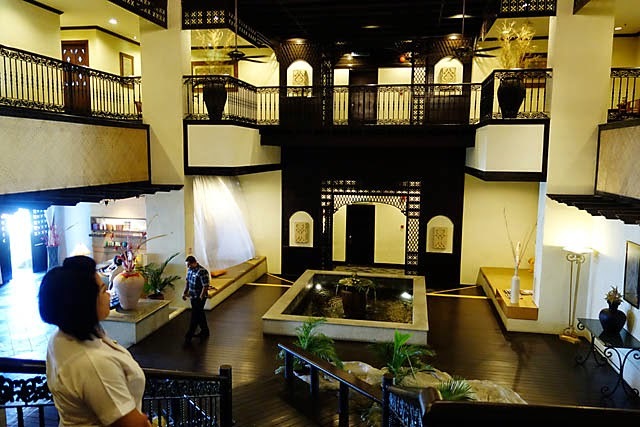 The rooms are absolutely fabulous, as befitting a 5-star resort. 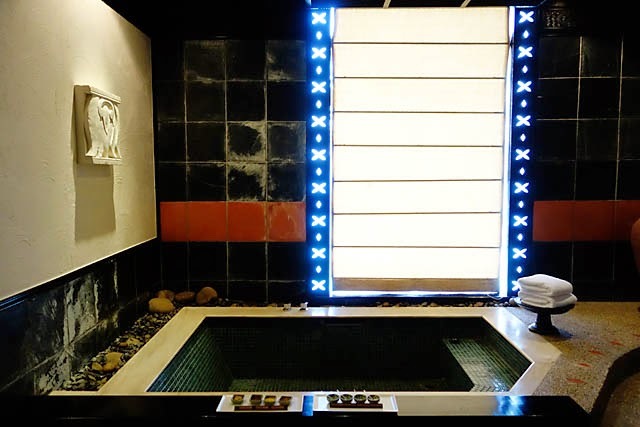 Targeted towards families and couples, the decor and ambience would certainly ensure a comfortable and relaxing holiday. Breakfast the next day was at Five Sails, which provided both local and international fare. Even Korean kimchi and Japanese sushi were part of the spread. But nothing beats local laksa made like what you see at the hawkers', except that well, this was in a 5-star environment ;). 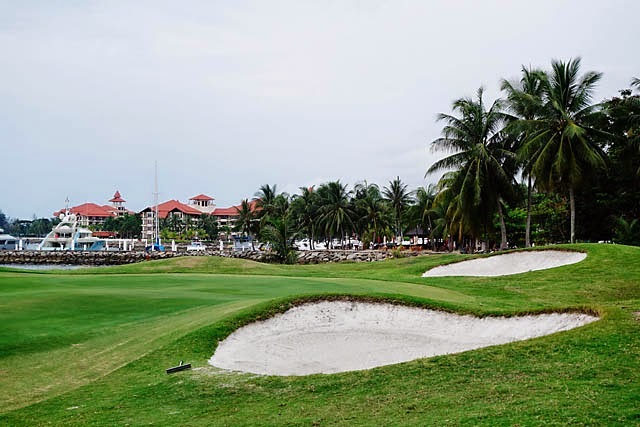 Sutera Harbour Resorts is also home to a 27-hole championship golf course, divided into 3 distinct 9-hole set - the Lake Course, the Heritage Course and the Garden Course. So naturally, in the late afternoon, we had a short stint at the driving range. Unfortunately, it would seem I am not cut out for golfing, with my golf balls skewing away in dangerous directions! And a blistered thumb for my efforts too :(. But it was still a happy ending, as later, we were driven around the golf course in a buggy, where we could appreciate the beautiful and thoughtful landscaping. 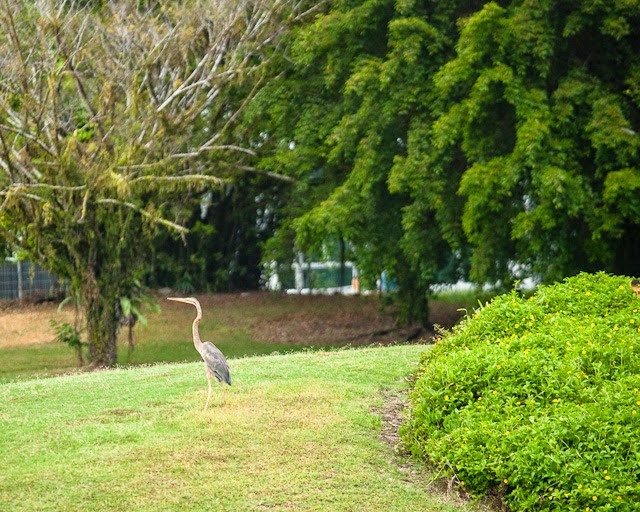 There is even wildlife found within the resort! 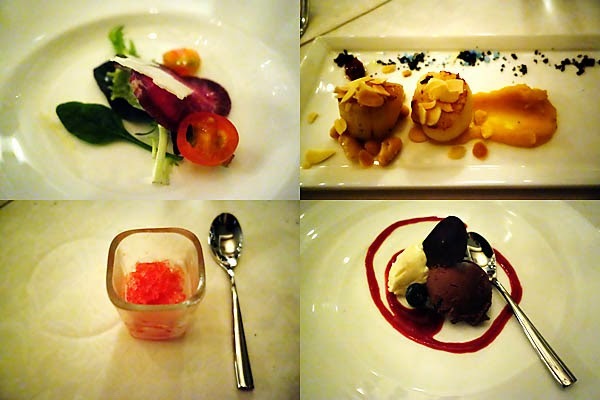 It was the final night of our stay, and a farewell dinner was specially arranged for us. After freshening up (those golf swings are tiring! ), we adjoined at the Ferdinand's for some fine dining. Also invited were Jason and Josephine, the marketing team from Sabah Tourism Board, who had kindly co-sponsored this campaign. In between fine food and wine, feedback and opinions were gathered and exchanged. If they had wanted to show another side of KK besides scaling Mt Kinabalu, they had certainly succeeded. During the past few days, I got acquainted with many other faces of Sabah, which I have yet to experience. 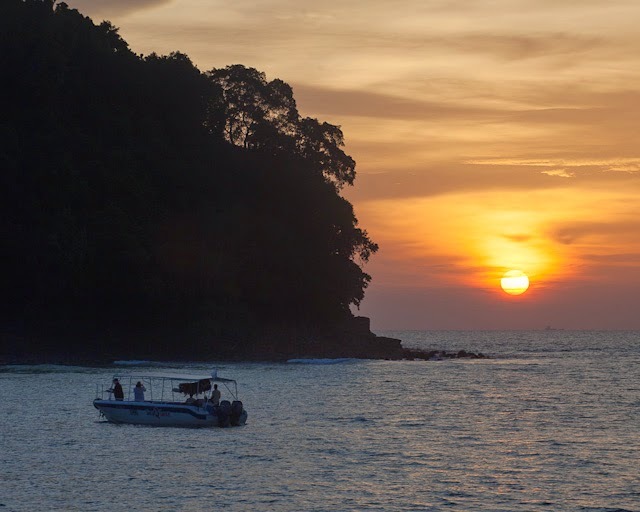 In particular, the wildlife and nature within Sabah have so much to offer. From Proboscis monkeys to Orang Utans, and from fireflies to the astonishing Rafflesia, I had envisioned that a revisit would be forthcoming. 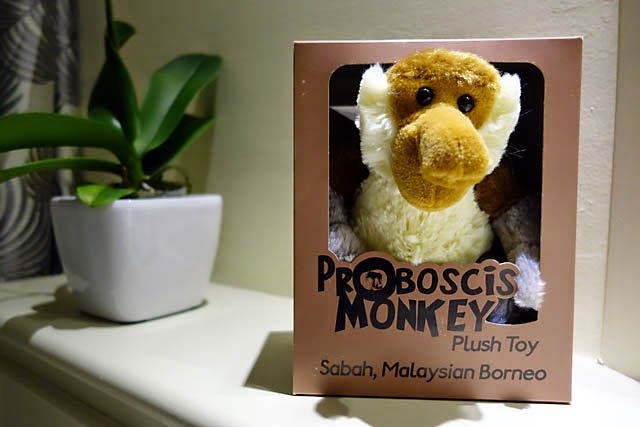 To our surprise, at the end of our dinner, we were gifted with a memento - a Proboscis monkey plush toy! No doubt, this would be a constant reminder for me about my revisit to Sabah! I guess a good massage is a good way to end a trip. 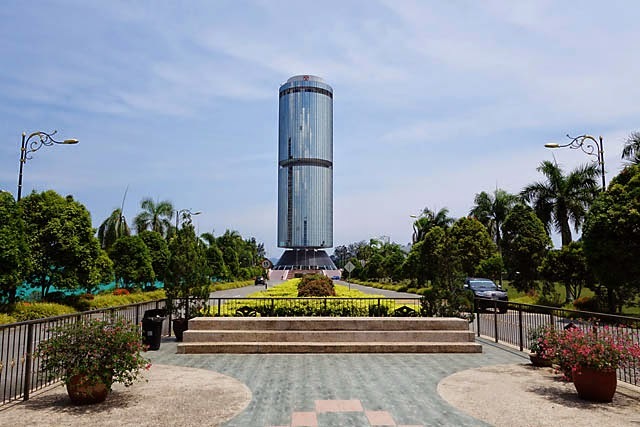 And so, as I sat on my AirAsia flight back, I pondered - what have I discovered in Kota Kinabalu? 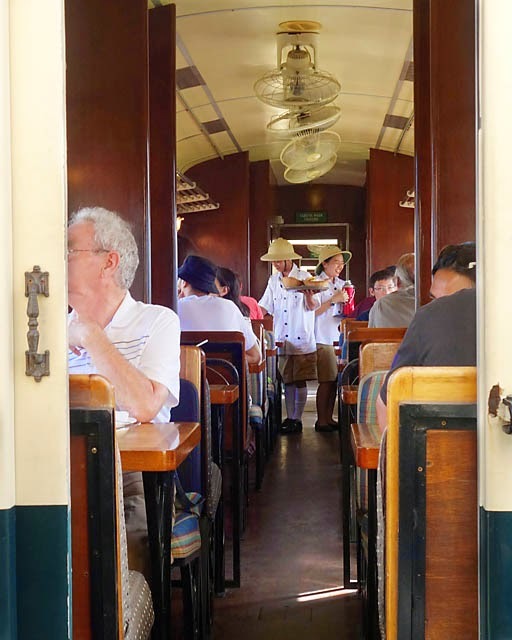 I have ridden on a historic steam-engine train, dived its crystal clear waters, savored its succulent seafood, zip-lined across its islands, cruised its shimmering seas, golfed its lush green courses, visited its cultural sites and parasailed its wide-open skies.